Home Shopping What’s Your Facebook Friends’ Selling Power? Are YOU Being Sold? Shopping with friends is the common favorite habit. We easily trust our friends when it comes to a product review or opinion. Our friend’s word is by far the most reliable thing we can base our judgments on: someone who is not biased, who has tested the product and has no reason to lie. Who’s your social media friend? But is this the case with our social media friends? Most of us have already 500+ friends on Facebook who can easily get in touch with us via a direct messages, who can see our personal updates and photos. However we don’t even know who the most of our Facebook friends are. When you open your friend list in Facebook, do you even recognize all the faces? Do most of them look even familiar? The social media world has changed the meaning of friendship. While our “real-world” friend is the person we can trust (because we think we know him well), our “social” friend is a stranger we can trust because he has no idea who we are and thus won’t judge us or make our secret public (as we just don’t have any acquaintances in common). Let’s not forget about the “anti-social” campaign which offered Facebook users a free burger for “un-friending” 10 of their friends. It was fully based on the today’s phenomenon: the majority of your Facebook friends are total strangers – why not sacrifice them for a burger? The campaign thus estimated the cost of your Facebook friend: 37 cents. So what is the social media friendship and trust? How do our social media friends influence our “real” life, our shopping and spending? Who and why do we trust when it comes to shopping? 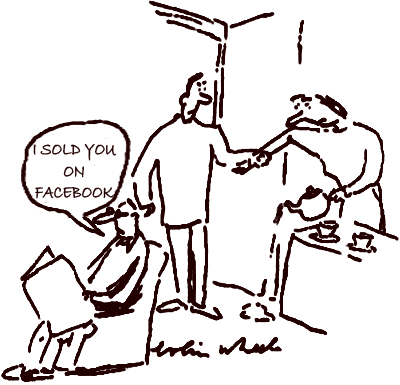 Do we trust our social media friends when making our shopping decisions? The stats results are ambiguous. While most of our social media friends are strangers, we still trust them enough to rely our shopping decisions on them. We trust people we know (but we do like strangers’ advice as well! ): According to Econsultancy survey of 2009, 90% of consumers who shop online trust recommendations from people they know; 70% trust opinions of unknown users. Most of us use social media: 80 percent of U.S. consumers say they use social media on a monthly basis. And most of us are “socialized shoppers”: more than 40 % of U.S. adults are using social media in their shopping experiences (according to Leo Burnett and Arc Worldwide research conducted in 2010). 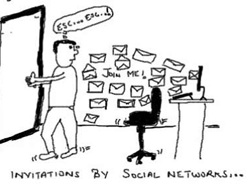 Our social networks play a great deal of influence on us when it comes to decision making: 50 % of of respondents (aged older than 25 years) and 65% of respondents (aged 18 to 24) said they considered information shared on their social media communities when making a decision (According to 2009 eMarketer survey results). Consequently, most of us are actually influenced by the shopping advice we get through social network: 74 % of those who received shopping-related advice through a social network found it to be influential in their decision. Besides, two-thirds of shoppers tend to spend more online after recommendations from their social friends. Lastly, the most “socialized” product categories are hardware/software and books: About half of respondents shopping for computer hardware/software and books are likely to incorporate social media into the shopping process while only 9% of people shopping for laundry detergent and soft drinks are likely to use social media (Leo Burnett and Arc Worldwide research, 2010). Given the amount of trust we have in our social media friends, it’s no wonder marketer take advantage of that. Joining social media networks like Facebook and Myspace to “befriend” your customer has long been a traditional social media marketing tactic. This is no news already. But what about the social media giant like Facebook that “sells” its advertisers’ products by incorporating the selling power of your social media friends? Its ad formats tell users which of their Facebook friends have expressed interest in the brand or product featured in the ad. These ad-formats are called “social-context ads” and are based on data collected on the likes and friends of its users. Think about it: you think the brand is cool, you push the “Like” button and now you may be advertising this brand to your social media friends! Are you a “socialized” shopper? Are you being sold? You may also enjoy reading Facebook for Business. Here’s an idea – don’t accept total strangers as Facebook friends. Then you’ll never need worry over their influence. Not all of us have 500+ friends as you say – I have less than 200. but I’m happy to say I know them all personally and they are, or have been, true friends at some point during my life. Much easier don’t you think? I’m with Richard – all of my Facebook friends are real friends. They’re people I know already, via personal contact or long-term email contact. I also restrict my Facebook info to my Facebook friends (not their friends or just anyone). I turn down friend requests from anyone I don’t actually know. I also regularly go through my friends list and just delete the people with whom I no longer have contact, or who never actually use Facebook. As a result, I feel pretty safe using Facebook (as long as I continue to opt-out of their ongoing attempts to share my info with the world! ).